Pictured L-R: Commander Ron Wheeler, Sue Wheeler and Post Adjutant James Elrod. 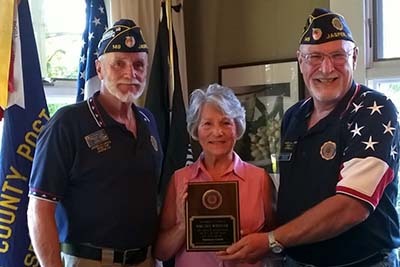 American Legion Post 149 honored outgoing Commander Ron Wheeler's wife, Sue Wheeler, last Saturday at Woodbridge Inn during their monthly meeting with a special plaque recognizing her continuous support of the legion. She has embroidered shirts and hats, cooked delicious dishes enjoyed by all at social gatherings, and supported her husband in any way necessary during his commander position. The baton will be passed in two weeks to a new staff, but Sue promises to continue her support.